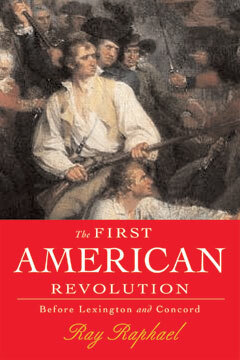 According to the traditional telling, the American Revolution began with “the shot heard round the world.” Now in paperback, Ray Raphael’s The First American Revolution uses the wide-angle lens of a people’s historian to tell a surprising new story of America’s revolutionary struggle. In the years before the battle of Lexington and Concord, local people—men and women of common means but of uncommon courage—overturned British authority and declared themselves free from colonial oppression, with acts of rebellion that long predated the Boston Tea Party. In rural towns such as Worcester, Massachusetts, democracy set down roots well before the Boston patriots made their moves in the fight for independence. Richly documented, The First American Revolution recaptures in vivid detail the grassroots activism that drove events in the years leading up to the break from Britain.